Why Milk is essential to stock for emergency? Milk is an important part of our diet. Milk products contain high quality proteins. The whey proteins constitute about 18 percent of the protein content of milk. Casein, a protein found only in milk, contains all of the essential amino acids. It accounts for 82 percent of the total proteins in milk and is used as a standard for evaluating protein of other foods. Protein is needed to build and repair body tissues and to form antibodies which circulate in the blood and help fight infection. Milk also contains the following nutrients: calcium, phosphorus, magnesium, and potassium. 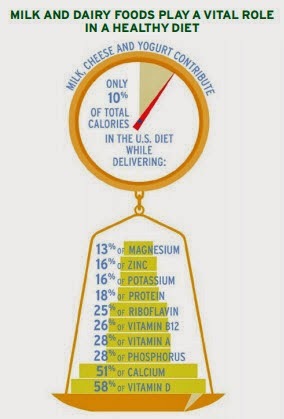 (See image) The calcium found in milk is readily absorbed by the body. Phosphorus plays a role in calcium absorption and utilization. Phosphorus is needed in the proper ratio to calcium to form bone. Milk provides these two minerals in approximately the same ratio as found in bone. Milk is also a significant source of riboflavin (vitamin B2) which helps promote healthy skin and eyes, as well as vitamins A and D.
These milk facts makes it obvious that a prepper’s ‘must have list’ should have Milk products. Recent price movements might make it difficult to get your hands on easily available Milk and dairy products. 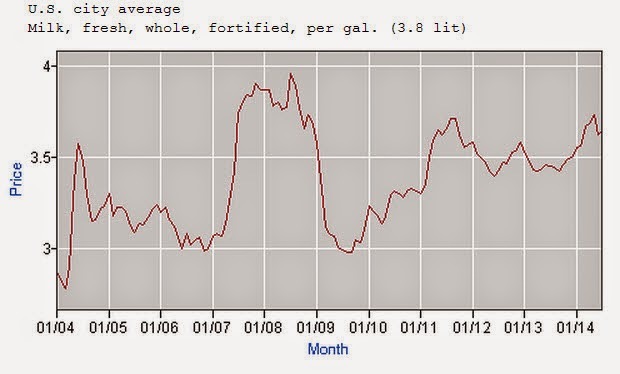 A gallon of fortified whole milk cost $3.69 in April 2014, a 7.5% increase from a year earlier and the highest price since September 2011. Stock up before it gets hard to find and becomes heavy on the pocket. Why settle for less when you can have the very best? 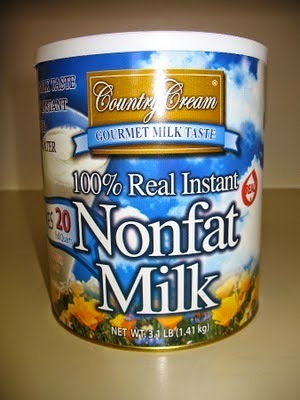 Country Cream 100% REAL Instant Powdered Milk is known world wide as the very best Instant Milk anywhere. Country Cream is the ONLY milk that tastes like REAL MILK when you mix it. 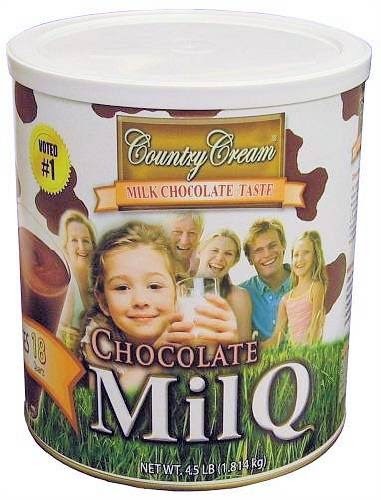 Every other manufacturer has tried to duplicate Country Cream but has failed. Made from the finest quality raw ingredients. Wonderful to cook with, as well as to make cheese and yogurt. This 100% REAL Instant Powdered Milk is packaged in premium #10 cans, that have been enameled to protect against rust on the outside and to protect against loss of the wonderful natural flavor in the inside. Packaged with an oxygen absorbed to remove the oxygen from the inside of the can and prevent oxidation and loss of nutrition. When stored in a cool dry place, the milk will be stable for as long as 10 years without loss of flavor and little loss of nutrition. Makes up to five gallons of milk per #10 can! This Powdered Chocolate drink is packaged in premium #10 cans, that have been enameled to protect against rust on the outside and to protect against loss of the wonderful natural flavor in the inside. 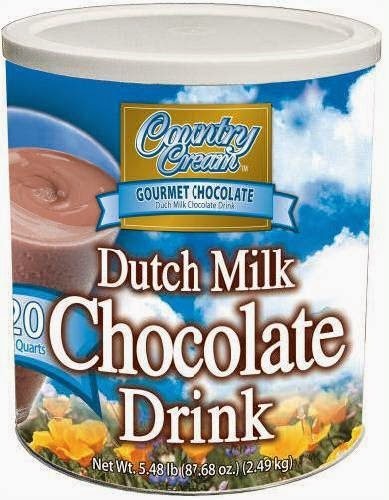 Country Cream® Dutch Chocolate Drink mix is a JUST ADD WATER product. #10 steel enamel can. Labels: canned food, Chocolate Milk, Grandmas County, How to be ready, Milk, Milk benefits, Natural disaster preparedness, Real Milk, safecastle, Safecastle sales, sale, storage food, supply food, survival, Why prepare?